"My name is Eddie Garrett and I am an idiot. I am addicted to losing." 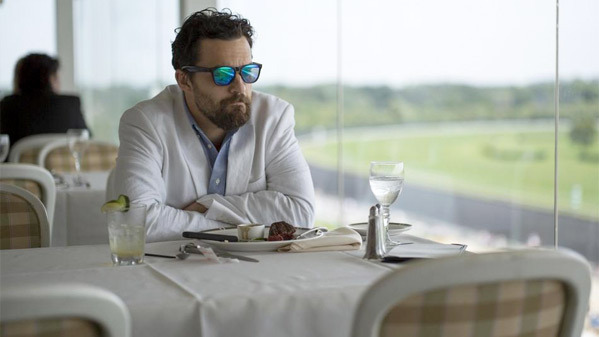 Netflix recently debuted the trailer for the latest film from writer/director Joe Swanberg, titled Win it All, which is premiering at the SXSW Film Festival in Austin, TX. Win it All stars Jake Johnson (who also co-wrote the script) as a gambler who is given the task of watching over a bag of money for a friend in jail, but he can't help spending some of it. Of course, he loses it and then his friend is expected to be released early. The cast also includes Keegan-Michael Key, Joe Lo Truglio, Aislinn Derbez, Jose Antonio Garcia, and Cliff Chamberlain. This looks somewhat fun to watch, with some amusing moments, but I'm just not feeling this film. Take a look. Jake Johnson stars in the film as small time gambler Eddie Garrett, who agrees to watch a duffel bag for an acquaintance who is heading to prison. When he discovers cash in the bag, he's unable to resist the temptation and winds up deeply in debt. When the prison release is shortened, Eddie suddenly has a small window of time to win all the money back. Win it All is directed by American filmmaker Joe Swanberg, of many films including Hannah Takes the Stairs, Alexander the Last, Art History, Drinking Buddies, 24 Exposures, Happy Christmas, and Digging for Fire previously. The screenplay is written by Joe Swanberg and Jake Johnson (who stars in the film). This film is premiering at the SXSW Film Festival this month. Netflix will then release Swanberg's Win it All streaming starting April 7th next month. Who's interested?